By Srinivas Chowdary Sunkara // petrobazaar // 23rd Nov, 2018. Fuel oil prices are edged down during the week. 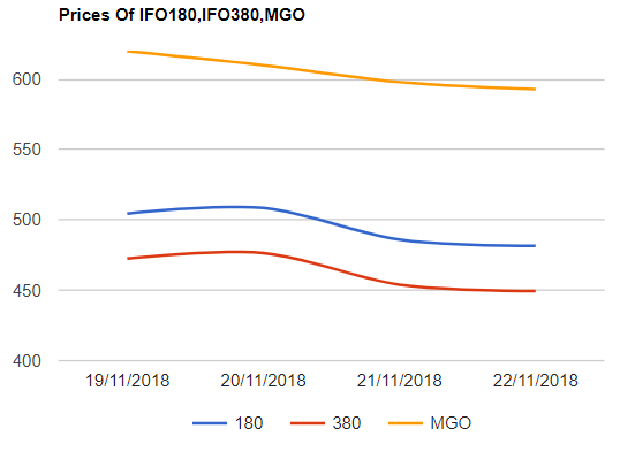 Both 180 cSt and 380 cSt graded fuel oil prices are slipped by $26.5 with 5.25 pct slump in Singapore market during the week. Lower fuel oil out put from UAE, North west Europe and a dip in fuel oil exports from Iran on US sanctions supported fuel oil prices last week. Further downside risk is limited due to tighter supply outlook in Dec. Turing to crude, Markets were in bearish mood through out the week as the financial markets plummeted on growth worries across the market. In India, Local Fuel oil prices slided in the second half of the month expected to fall further.